Bruce Willis returns as the seemingly indestructible everyman John McClane in A GOOD DAY TO DIE HARD to try and mend fences with his estranged Jack (Jai Courtney). Jack has been arrested for murder, and when dad sees him escape from his trial along with dissident Yuri Komarov (Sebastian Koch), he stops the boy to ask what's happening. Well, as it turns out, Jack is a CIA agent tasked with bringing Komarov in, and dad has just screwed up his mission. Now in order to escape the bad guys who want the file Komarov has hidden away, they'll have to improvise. As any fan of the series knows, that's John's specialty. The script by Skip Woods starts out looking like it wants to give the DIE HARD series a modern post-BOURNE makeover, but those elements go by the wayside pretty quickly in favor of more of the same with Willis taking considerable punishment but always managing to get away and get the best of his enemies, tossing off the occasional one liner as he goes along. The only real deviation from formula are the clichés brought in from other movies, like the ever popular son who resents his dad for always working too much and never having time for him as a kid, who nonetheless has grown up to be more or less just like his old man. Gee, think they'll reconcile between the gunshots and helicopter crashes? This played out material isn't helped by John Moore's sloppy, indifferent direction. He stages some pretty big and complex action set pieces, including one that has to set the all-time record for a supposed hero causing property damage and probable injury (and maybe even death) to innocent parties, but none of it thrills like it should. Even Willis seems to be phoning it in, and the rest of the cast doesn't do much to pick up the slack. Anyone who regularly reads my reviews on The Cleveland Movie Blog knows I have a soft spot for 80s action films and their stars. Even recent mediocre flicks from Stallone and Schwarzenegger get a passing grade (just barely, but still passing) from me. Even with my standards being admittedly low, however, I expected more than that from Willis and the DIE HARD franchise. This is a series that many would say set the high water mark for eighties/early nineties action films not just in terms of spectacle, but by actually being good movies to boot. This is not a good movie. It's not even a mediocre one. It's just bad, and more than a little sad. 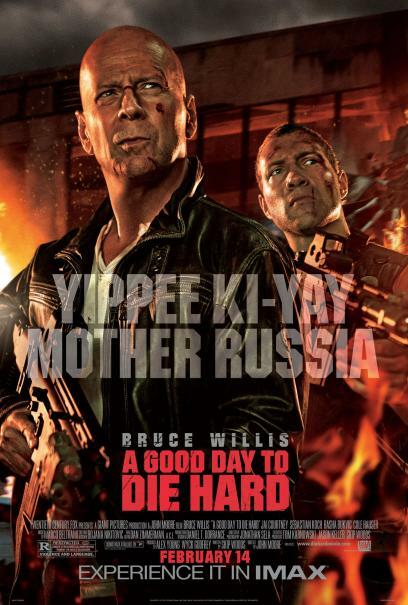 They should have called it "Die Hard with a Whimper". 2 out of 4 stars.